Way back in the dim, dark days of my childhood, I somehow missed how often episodes of my favourite TV cartoons were repeated. Not surprising in one way since (a) I was a child and the immediacy and fun of something was the preoccupation, not a statistical repeating pattern – unless I’d been a maths prodigy in which case that might have been all I thought about – and (b) cartoons were usually screened during school days, spaced just far enough apart that any remembrance of episodes was dim and foggy at best. So it was in the mid-’70s that I missed the fact that The Addams Family animated series, made in conjunction with Charles Addams upon whose The New Yorker cartoons the show was based, had but a scant 16 instalments to its spooky name. It mattered not, as did the essential repeat of each episode’s narrative – the Family would roll into town, have a delightfully creepy time according to their delightfully twists whims and desires, spending money hand-over-fist at which someone, who would not triumph in the end, would try to take advantage of their Otherness. It was a well-worn groove but so perfectly executed, with the vivacity and joy of people unaware, and likely uncaring even if they were cognisant, of their inherent weirdness, their complete and utter departure from societal norms, that you couldn’t help but get swept up in it. That I think was the key to this shortlived series which nevertheless left quite an impression on me. For a young boy struggling for being teased for being Other – I was gay, something I didn’t fully acknowledge ’til many years later but which my fellow students seized upon with malicious glee almost instantaneously – and not really fitting in no matter how I tried, finding, subconsciously at least, that there was an entire family who were wholly different and didn’t fit in, was reassuringly comforting. Admittedly I didn’t exactly sit there and psychoanalyse their appeal – I was always self-aware true but at the end of the day I was kid first and foremost – but deep down I knew that Gomez (Lennie Weinrib) and Morticia (Janet Waldo), Pugsley (Jodie Foster, yes the very same) and Wednesday (Cindy Henderson), Lurch (Ted Cassidy), Uncle Fester (Jackei Coogan) and Grandmama (Janet Waldo again); only Coogan and Cassidy reprised their roles from the 1964-66 TV series – but I knew, I KNEW, that what The Addams Family faced I faced. And that made them, in a way, my kind of animated people in a way that Scooby Doo or Wacky Races, fun though they were, never quite were. 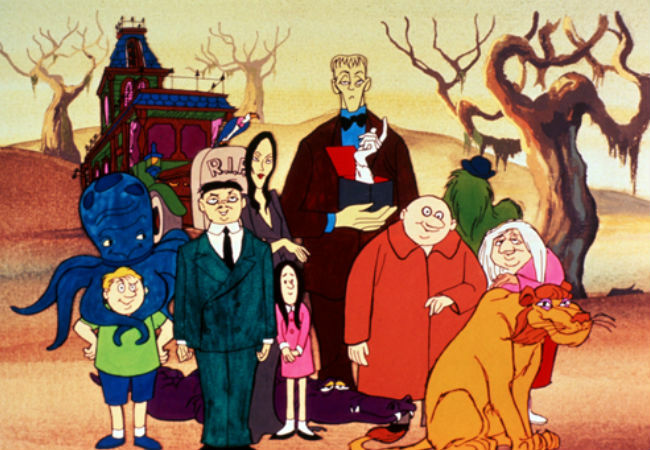 What was appealing about The Addams Family, which got its start in animated form at least in an episode of The New Scooby Doo Movies, “Scooby-Doo Meets the Addams Family” (a.k.a. “Wednesday is Missing”) which aired 23 September 1972, was how self-contained and happy they were. It didn’t matter if they were camped out in New York’s Central Park, being sold the Museum of Natural History or the green space in which they resided itself by opportunistic shysters, or out in the creepy swamp Everglades or the bright lights of Nashville, they were content to dig a moat around their spooky camper van, which came complete with bats in the belfry, fill it with Insta Swamp Monsters and sit back and take the world in. And if it was raining? Then all the better, an enhanced day not blighted by sunshine or roses or any of the things most people consider the marks of a well-built society or time fruitfully-spent. Grandmama would make a freakishly nasty brew of some kind, Uncle Fester would try to construct a dinosauric monster out of bones – a totally original kind of model kit – and Wednesday would pursue ownership of the legendary Boola Boola with the sweet “I MUST have this!” intensity of childhood, and all would be right with the world. The thing is they all loved and accepted one another, Gomez and Morticia most especially whose grand French-accented love affair was the stuff of late night legend, and whether they were sleeping out under the stars or occupying themselves in their alligator and octopus – the series introduced us to Ali the Alligator, a trusted steed who took them everywhere, and Ocho the Octopus – they were totally and utterly comfortable in their own skins. Each episode came with the requisite number of visual gags of people almost jumping out of their less-comfortable skin when they realised that the toll for entry to the park was being paid by Thing, or reacting with ill-disguised, or not-disguised-at-all horror, when they found themselves in the unusual camper van and found that the ornaments, animals and damn near everything else was alive, hungry and fiercely-protective of The Addams Family. And no matter who tried to take advantage of their Otherness, or thought they were an easy mark, the naively-trusting Family always came on top, proof that being different and being happy about it – swamps the perfect holiday location? Naturally! The supernatural an ordinary part of life? But, of course! – didn’t have to be something that cost you – in my case any semblance of a peer-supportive childhood – but could be the very thing that happily defined you, irrespective of whether the world around you, and really what do they know, accepted you or not.